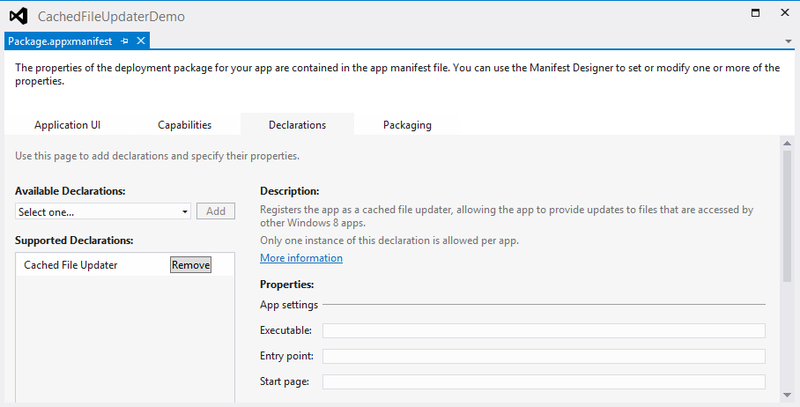 As you can read on MSDN, there is in fact a lot of contracts available for a Windows 8 app. Today, I want to describe one which is very useful for the Dropbox client I work on (8 Files In A Box) : The Cached File Updater contract. As you will see, it can be really useful with the FileSavePicker contract. The code of this blog post is available here. 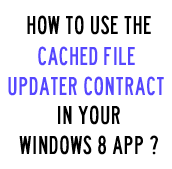 The Cached File Updater contracts simply declare that your app is responsible for the management of one or many of its files. This is really useful for ‘file management apps’. Activate the app before a read is done to your file. Activate the app after a write is done to your file. Set your file as read-only. Use a cached version of your file is internet is not available. I refer to “a file” but this can be done on any file of your app. Using this contract is done in 4 steps, one being optional. 1)Declare the contract in the manifest. 2)Define some triggers on your file. An id which will be passed to your app when activated for this file. A ReadActivationMode which define if the app is activated before the file is accessed or not. A WriteActivationMode which tells if your app is activated after an other app writes “on” your file, or if the file must be read-only. A CachedFileOptions which tells how “behave” acces to the file when there is no internet connection. 3)Override the OnCachedFileUpdaterActivated method of the Application. An event “FileUpdateRequested” which will be raised when the previously defined triggers are reached. The property “UpdateTarget” which tells you if the file to update is “remote” (the file in your app) or “local”(the file in the other app). 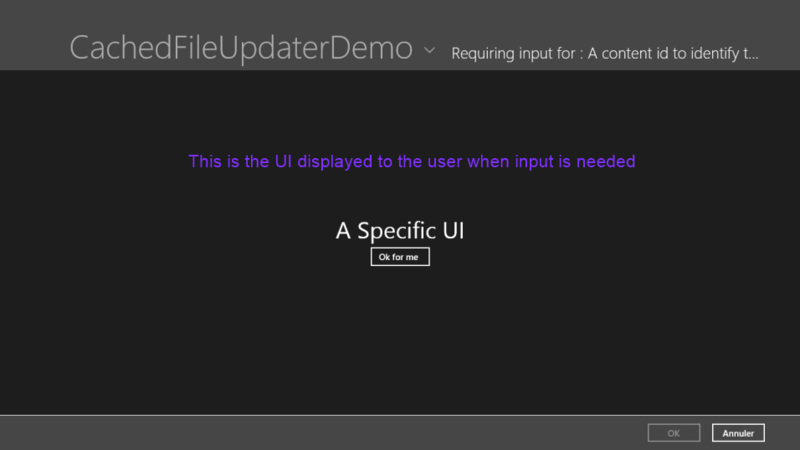 When you don’t have to show any UI to the user, you’ll simply have to grab the file when the FileUpdateRequested event is raised and do something with the file. If the local file have to be updated, you can call the UpdateLocalFile method and provide an up to date file. Also, you have to set the “args.Request.Status” depending of the success of the operation (in our case to FileUpdateStatus.Complete). 4) Ask the user for some input (optional). If the update process needs it, you can ask the user for some input. To do so, you have to tell it in the FileUpdateRequested event handler using the args.Request.Status and set it to FileUpdateStatus.UserInputNeeded. The UIRequested event is then raised and you have to set the content of the Window to your specific UI in the handler. Don’t forget to do it in the right thread.Don’t forget to do it in the right thread : create the page in the first activation event and use the page Dispatcher to set the content. The FileUpdateRequested event will then be raised once more to inform you that the UI is visible. In the handler, you have to grab the event args and pass it to your UI. The UI will then be responsible to set the Request Status to the correct value. In my case, I save the args as a static field of my application. sender.Title = "Requiring input for : "
//Do nothing, the UI will do it for us. Why is it useful with the FileSavePicker ? In 8 Files In A Box, the Dropbox client for Windows 8, we wanted to be able to save a file and to upload it directly to the user Dropbox. no way to know when the provided file is fully written by the other app. no CPU time because my app is no more running. Leonard one of my Infinite Square colleague demonstrated me that I was wrong (and that impossible is really not a French word:)). Provide a file the usual way in the file save picker UI. Use the WriteActivationMode.AfterWrite trigger on it. Launch an upload when my app is activated after the write is done. 1) don’t forget to activate your app. At first, I did not manage to make it works : the OnCachedFileUpdaterActivated method was called but the OnCachedFileUpdaterUIFileUpdateRequested event was never raised. After some research on the internet, I finally found that the Windows.Current.Activate() call to activate your app is really necessary : do not forget it 🙂 ! Finally, I just want to remind you that the app requesting the file is responsible to let Windows know that it has no more use of the file (the write is done). So if your app is not activated, it could be because the requesting app is simply not asking you to update the file. // finish making changes and call CompleteUpdatesAsync. //  app can update the remote version of the file. // Completing updates may require Windows to ask for user input. When your app is activated, a Dispatcher is created for it. The CachedFileUpdaterUI use another Dispatcher and you have to be careful to be on the right dispatcher(yours) when updating your UI. For example when you set the content of your Windows, don’t forget to do it on your Dispatcher. I let you digg into my attached code for a more complete example. If you want another sample, you can download and use the File Picker sample on MSDN. That’s all for today ! « C++/CX : How to expose/convert an existing concurrency::task to Windows::Foundation::IAsyncAction^ ?